Edward Doheny and his partner Charles Canfield were the first people to discover oil in Los Angeles, in 1892. In 1926 he built Greystone on 12 acres of land as a gift for his son Ned. Ned only lived in the house four months before being found dead in an apparent suicide pact with his personal assistant. He was 36 years old. The house was designed by Gordon Kaufman. The gardens were designed by landscape architect Paul Thiene. His father was most famous for his involvement in the federal bribery scandal, Teapot Dome. 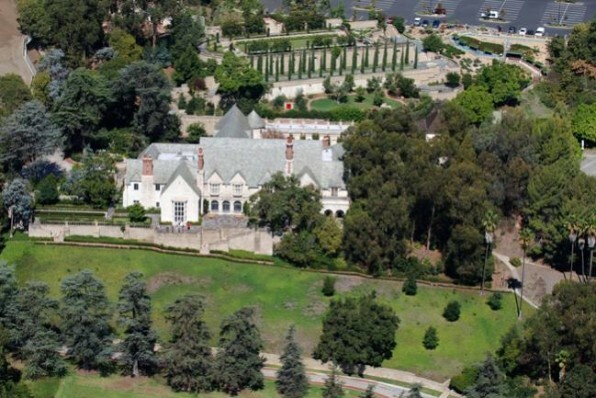 Ned’s widow Lucy would eventually sell the adjacent 429 acre Doheny Ranch to Paul Trousdale, who sub-divided the property and developed Trousdale Estates. She sold the house to Henry Crown, the owner of the Empire State Building, who regularly made it available for television productions. The property in now operated as a park by the City of Beverly Hills. This entry was posted on Monday, November 15th, 2010 at 1:21 am	and is filed under notable homes. You can follow any responses to this entry through the RSS 2.0 feed.